M-NASR proudly serves Area 18 covering the Northwest Suburbs of Cook County. 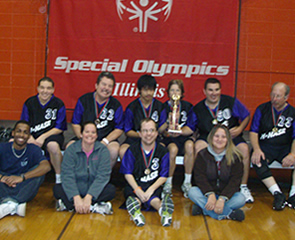 Special Olympics Illinois has 18 areas throughout the state with each area responsible for providing Olympic sports within the communities they serve. Identified by an agency or professional as having one of the following conditions: intellectual disabilities, cognitive delays as measured by formal assessment or significant learning or vocational problems due to cognitive delays that require or have required specially designed instruction. Children ages 2-7 with intellectual disabilities, along with their siblings and peers, are introduced to the world of sports. This program improves physical, cognitive, and social functions. Activities include foundational skills, walking, running, balance, jumping, and trapping, catching, throwing, striking, kicking and advanced skills. For more information about our Special Olympics Young Athletes program, please contact us at 847-966-5522. For more information about Special Olympics programs, please contact Sarah Groeper at 847-966-5522 ext. 3025 or sgroeper@mnasr.org.